It may have taken almost 2 months but Richo and I have finally got our acts together and sampled our second Abstrakt beer. This is actually the beer that inspired this whole challenge, so impressed were we with this beer the first time we had it. We've managed to get our hands on another bottle and can't wait to try it again! So AB:04 is supposed to be a coffee dominant stout. It's had cacao and chilli added for a bit of complexity. The chillis used are in fact Naga Chilli's, previously recognised as the hottest chilli in the world. You can't say BrewDog do things by half measures can you? Interestingly enough this is not the first beer that I've had to use chilli, Mikkeller's Mexas Ranger used plenty and is a brilliant beer! Hopefully this beer is just as good! Much like AB:03 the head dissipates incredibly quickly. As you can see from the photo there is only a small ring of dark brown bubbles ringing the glass. This doesn't take anything away though from the brilliant pitch black body of the beer. It's a stunning look with even less transparency than the darkest of stouts. If this beer had more of a head it would be really hard to beat in terms of appearance! 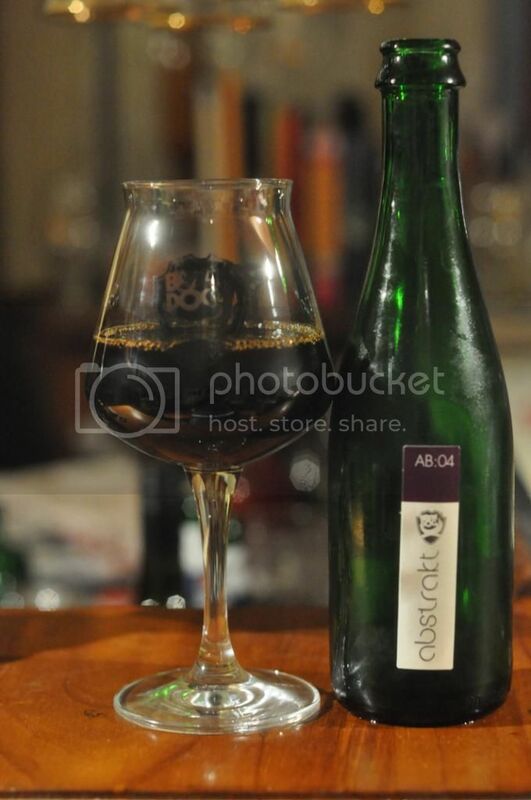 The nose that BrewDog have managed to produce for AB:04 is simply unbelievable! The chilli aroma is so strong yet it doesn't seem to affect any of the other aromas or overpower anything. The roasted malts are also a prominent feature of the nose as are chocolate and coffee. The chilli smell becomes even more pronounced as the beer warms further but somehow the overall nose stills works as a collective. It's an amazing piece of brewing skill! We probably hadn't had the beer out of the fridge for long enough before we sampled it as when we first tasted this beer it was very coffee heavy with little else showing through. As the beer warmed though it became more and more complex. There is still heaps of coffee and dark chocolate but the amount of roast and smoke is phenomenal and the chilli kick at the end is fantastic. What a stunning effort here from BrewDog! It has been far too long between drinks, but what a drink to come back to! Abstrakt No. 4 is without a doubt one of the most interesting beers I have ever had the pleasure of tasting. It is difficult attempting to find the right words to describe this smooth, thick almost syrupy concoction; it is even harder trying to distinguish all the different flavours that emerge as the beer rises in temperature. The flavours seem random at first glance; the coffee and cacao are fundamental ingredients of a hearty stout, made all the more so by the introduction of chilli. While this seems arbitrary, the chilli gives this brew a necessary bite, which enhances the effect of the corresponding flavours. However, as with last time, the interesting mix of flavours serves only to bring forth another embarrassing episode in the saga of my existence. It is often said that nothing motivates a man to push through pain and suffering than the love and attention of a beautiful woman. This story is no different. While traveling through Spain earlier this year, my friends and I met with some beautiful locals; who agreed to take us to one of their favourite restaurants. While perusing the menu, I noticed that one of the meals came with “Death Sauce” (as I look back now, it is very appropriately named). Fueled by exotic passion, too many bottles of San Miguel and my own inherent stupidity, I agreed to consume the hellish meal in an effort to impress our seductive companions. What followed was the standard bodily reaction to incredibly spicy things: my lips went numb, I lost all feeling in the bottom half of my face, my breathing became rapid and laboured, tears were streaming from my eyes and to top it off, the once clean shirt I had been wearing was now thoroughly drenched. Suffice to say the local girls were not impressed, and neither were my friends; but at that point the cold embrace of death was all too appealing. My night was ruined, mouth was scarred and my pride once again took a hit…..seriously f**k chillies. It's easy to see why this beer has a RateBeer score of 100! It is simply the best stout that I've ever had, bar none! The flavour compliments the thick texture brilliantly and the lack of head that was mentioned earlier is forgotten by the brilliance of the rest of the beer. It is a crying shame that there were only ever 3300 bottles of this beer made! If there are any left they are worth any price the purveyor is asking, words fail to fully explain just how good this beer is!